Open to anyone with a car and helmet, Autocross is a popular exhilarating motorsport that involves a diverse range of cars - Golf GTI, Porsche 911, BMW's, Mazdas. Aimed at drivers who race their cars on a regular basis - whether at the weekends, semi-professional, or full time - this thorough-going and easy-to-follow handbook covers everything from choosing the best car and class to tuning, modifying and racing that car. Richard Newton is an Automobile safety Expert certified Master technician, who has raced autocross cars and has extensive experience in the auto service industry and as an autocross writer and editor. Here, in reader-friendly fashion, he talks about what can be done, why it needs to be done, what should be modified when conditions change, and how to do it. With accompanying full-colour illustrations, this guide covers all engine and drive-train combinations, focusing on car systems such as brakes, tires, suspension, engines, wheels, amongst others. 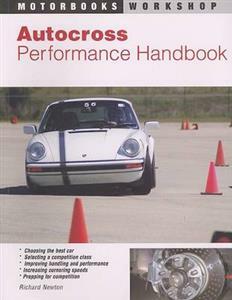 there is a complete reference appendix to round of this invaluable guide for the autocross participant. SportsCar Magazine, September 2007"Author and autocross addict Richard Newton has covered every aspect of autocross from car and class selection to setup and driving. ""This book should be in every autocrosser's passenger seat. If you are an autocrosser you need this book" - Blau Rain"The experiences autocrosser will certainly be inspired by all the trick setups shown in the illustrations. But the meat is in the detailed descriptions, explanations and suggestions made in the body of the text." -Bruce Herrington, Unsere Gedanken "Written for the beginning autocrosser, this book is 160, very readable, pages long. The experienced autocrosser will certainly be inspired by all of the trick setups shown in the illustrations. But the meat is in the detailed descriptions, explanations and suggestions made in the body of the text." Bruce Herrington, "Unsere Gedanken"
Richard Newton is an ASE-certified Master Technician who spent 15 years in the automotive service industry before becoming an automotive magazine editor and freelance writer. He has written five books to date, including Corvette C5 Performance Projects, 101 Projects for Your Corvette and Ultimate Garage Handbook. He currently resides in BonitaSprings, Florida.